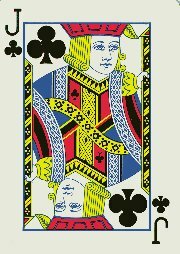 Everyone has seen or heard of playing cards, they seem a part of everyday life, and seem to have always been around. However mundane and overlooked, they are uniquely remarkable and a design classic. 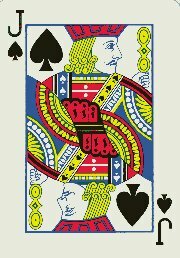 The story of playing cards is history itself. Playing cards and ‘the game of deputies’ was originated during The Mameluke Empire, when the Muslims used ornate, carpet-style designs to differentiate each card. This remains today — but only as patterns used on the reverse side of the cards. The cards and games then caught on in Italy and Spain, and the designs changed to male characters, (in a selection of poses, costumes, colours and attributes) to make them easier to tell apart at a glance. Early European card makers had 12 characters to colour by hand and print from woodblocks cut from planks (along the wood grain). This method could not use the very fine lines that wood engraving did later (being made from woodblocks cut across the grain of the wood). 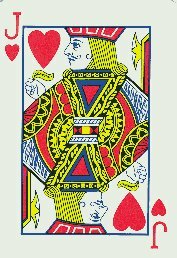 In Renaissance Italy, between 1410 and 1430, the four-suited deck was extended by the addition of special cards which could beat any card of the four ordinary suits. These extra cards and the game played with the extended pack were called ‘Trionfi’ (triumphs), from which the word Trumps is derived. From the 16th century onwards the game and cards came to be known by the alternative name Tarocco. When the game spread to France, Switzerland and Germany, the word Tarocco became Tarot in French and Tarok in German (various alternative spellings are found). After some initial experiments with number of trumps and number of cards per suit, by the end of the 15th century the 78 card pack with 21 trumps, 14 cards per suit and a fool had become fairly standard, though with some variations in the ordering of the trumps. 62 card packs (10 cards per suit) and 97 card packs (40 trumps) also existed and survived to the 20th century. For the first 350 years of the existence of Tarot cards, until the 18th century, the suits used were always the standard Latin (Italian) suits, the same as in the original four-suited pack. In Italy and parts of Switzerland Italian suited Tarot cards are still used to the present day. While the Italians developed Tarot, ‘regular’ cards spread to France, where, in the 15th century, French card makers substituted a Queen instead of the Cavalier before being taken up in Scotland and England. A deck from Rouen, before 1516, depicts elegant courtiers dressed in elaborate French court costumes typical of the period, with some characters seen from behind, with their heads turned back over the shoulder to produce a facial profile. 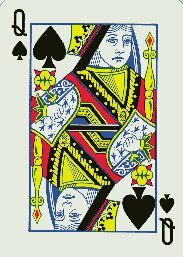 In the 18th century the Germans replaced the Italian Tarot suits (bastoni spade coppe denari) by the more popular French suits (spades, clubs, hearts and diamonds), and printed more prominent numerals (Arabic or Roman) on the trumps for easy identification. The Austrians and French copied this later. 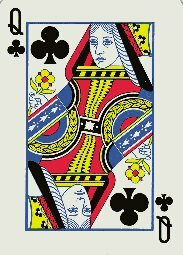 The court cards became double-ended, with a mirror image to save having to turn cards around, however, with the legs lost, the original characters became distorted and abstracted. Indices originally appeared as a miniature card in the left hand corner, and a letter index was later added. The makers naturally picked the first initial of two court cards giving the indices K (for the King), Q (for the Queen) and the first 2 initials of Knave giving Kn. The suit sign was added to the letter index and the miniature card abandoned. 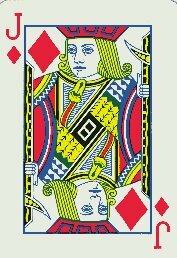 However, as six of the court cards had their suit signs on the right (an inconvenience when cards were fanned), turning some of the court characters round to face the other way allowed the suit sign to be consistently at the top left and bottom right. In the game of ‘All Fours’, Jack is the name of the point awarded for winning a trick containing the Knave of trumps. It was therefore also applied to the Knave of trumps itself in this game [quoted in Cotton’s Compleat Gamester of 1674-80]. Later it also meant any of the Knaves [see Martin’s English Dictionary of 1749]. At first Jack was considered a lower class term [see Dickens’s Great Expectations, 1861; Estelle says mockingly of Pip ‘He calles the knaves, Jacks, this boy!’] but it gained acceptance while Knave became obsolete. Modern English usage has knave now left with just one of its original meanings — a scoundrel. 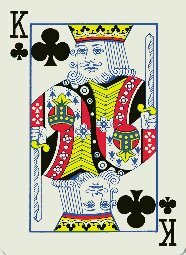 By using an alternative term for a common man which was also associated with the Knave card, Jack, court card index letters became K, Q, J, and the character is now known as the Jack. Although this British deck was developed into the International pack used throughout the world today, however, there still exist a variety of other systems. The use of names printed on French cards meant for use in France goes back a very long way — probably before the emergence of the English or French patterns. The courts on the French pack must not be taken as portraits of the persons named; there can have been no known portraits of some of them, e.g. Hector of Troy. In fact the link between the name and the figure is in the (imaginative) heraldry displayed by some of them. There have never been any such indications on the courts of the English pattern, except that the fleur-de-lys on the gown of the King of Clubs and the orb topped with the cross of Lorraine may be an indication that he is meant for a French king, reflecting the French origins of the English pack. But the very similar Charlemagne of the French pack also shows the other half of his coat-of-arms, namely half of the two-headed imperial eagle. 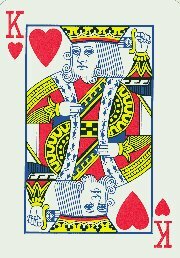 The English King of Diamonds is very similar to the French King of Diamonds (who once had the imperial eagle of Caesar), but is evidently a poor copy, leaving his fingers with nothing to do. 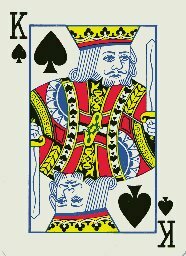 The English King of Spades could be anyone while the figure of the English King of Hearts also appears in other patterns, one being Italian. Although the French named-card tradition goes back to the 16th century the actual names used have varied enormously and the most constant of them have not been applied consistently to the same cards. David, Judith, and possibly Rachel appear to be biblical; Alexander, Caesar, Hector, and Pallas are classical, as also is Argine (anagram of regina or corruption of Argea); Lancelot must be drawn from the Matter of Britain. Charles may be Charlemagne, and Hogier his distinguished cousin, or he may be Charles-7 of France, Rachel (his mistress Agnes Sorel), and La Hire, a knight of his court. 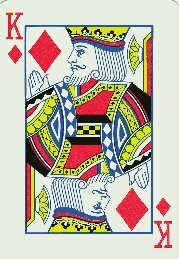 The Kings, Queens and Jacks of the standard English pattern do not represent anyone. They have never carried names, nor is it probable that they originally portrayed anyone. The objects carried by the courts have no significance. They indicate the rank of the court card and differentiate one court card from another. They have become distorted over time. The reason for the Ace of Spades being so ornate and elaborate in design is that it originally carried the taxation stamp (there was a tax on playing cards). When taxation of cards stopped, the printers continued with the format using their own designs and trademarks. From the late 18th century, occultists became interested in Tarot cards and began to revise the designs and terminology to suit their purposes and theories. Some of them introduced the term “major arcana” for the trumps, some transformed the coins and batons into pentacles and wands, and some adjusted the names and in some cases the sequence of the trumps. When card players see writing about Tarot using the terms “major arcana” and “pentacles” in place of trumps and coins they tend to assume that the writer comes from the occult tradition, and is probably more interested in divination than in playing card games. The Curse of Scotland. The nine of diamonds. That it is derived from the nine lozenges that formed the arms of The Earl of Stair, who was especially loathed for his connection with The Massacre of Glencoe and the union with England (1707). That the order for the Massacre of Glencoe (1692) was signed on the back of this card. The word ‘curse’ is a corruption of cross, and the nine of diamonds is so arranged as to form a St.Andrew’s Cross. 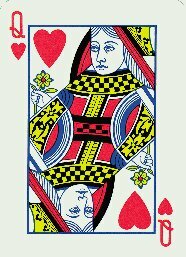 That in the once popular round game ‘Pope Joan’, the 9 of diamonds was called the Pope, the antichrist of Scottish Reformers. 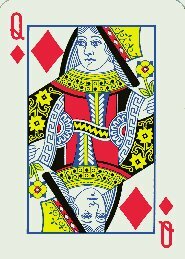 That the 9 of diamonds was the chief card in the game ‘Cornette’, introduced into Scotland by the unhappy Queen Mary-1. That ‘Butcher’ Cumberland wrote the orders for The Battle of Culloden, 1746, on the back of the card. That the dispositions for the fatal Defeat at Flodden (1513) were drawn up on it by King James-4 of Scotland. This was in the form of a ha’-penny broadsheet, surrounded by rude cuts of a suit of cards, in black, and was printed in Newcastle. 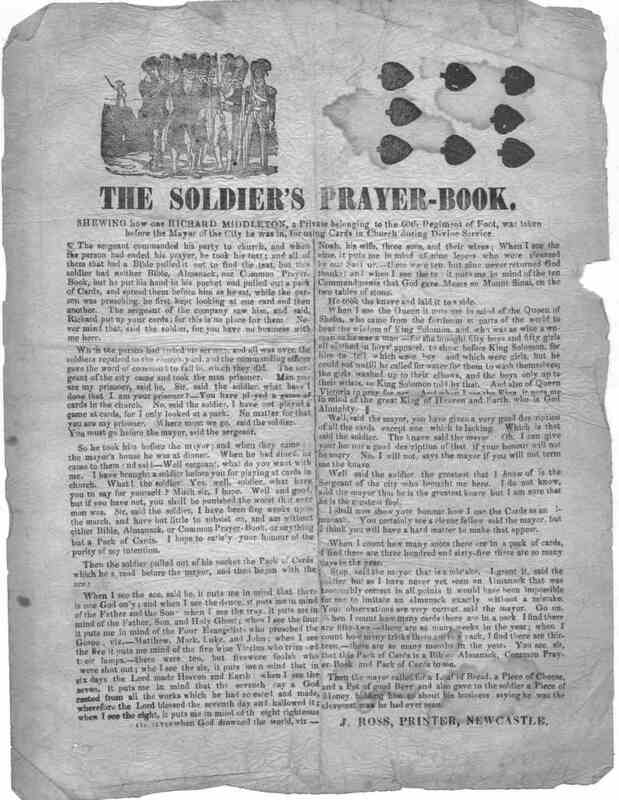 Richard Middleton, a soldier, attending divine service, with the rest of the regiment at a church in Glasgow, instead of pulling out a Bible, like his brother soldiers, to find the parson’s text, spread a pack of cards before him. This singular behaviour did not long pass unnoticed, both by the clergyman and the sergeant of the company to which he belonged; the latter in particular requested him to put up the cards, and on his refusal, conducted him after church before the Mayor, to whom he preferred a formal complaint of Richard’s indecent behaviour during divine service. He took the Knave and put it aside. ‘Which is that?’ said the soldier. ‘The Knave,’ said the Mayor. The Mayor called his servants, ordered them to entertain the soldier well, gave him a piece of money, and said he was the cleverest fellow he ever heard in his life. The Chevalier de Chatelaine, well known for his humorous French versions of English poets, some two years since, privately printed a versified account of this story; but he was perhaps unaware that he had been preceded in his own language many years before in an Anecdote ‘curieuse et interessante, sous le nom de Louis Bras-de-fer’, printed in Brussels in 1778; and also at Paris, in 1809, a similar flying sheet appeared. Mlle. Lenormand also published it in her ‘Souvenirs Prophétiques’. The soldier is renamed ‘Richard Pike’. This entry was posted on Wednesday, September 6th, 2006 at 00:47 and is filed under Design Icons, Everyday Wonders, Icons. You can follow any responses to this entry through the RSS 2.0 feed. You can leave a response, or trackback from your own site. Do you know what style art the British / International Standard Design is? I would love to see more designs with this style art. Excelente artículo! Leerlo fue de mucha utilidad, te agradezco. Si te interesa, yo tengo un sitio con mucha información sobre el Cabello Lacio.